Do Ya Wanna (Kindle) Touch? | Do Ya Wanna (Kindle) Touch? – The Republic of T.
Do Ya Wanna (Kindle) Touch? Before I begin, like I said before, I already know all the reasons I shouldn’t have slurped down another cup of Amazon’s Kool-Aid. And my answer is the same as it was when I was debating whether to buy a Kindle Fire or wait for the iPad 3 to buy my first tablet device. And on, and on. Substitute any other company for Amazon or Apple, any company whose products I use or come into contact with in the course of a day, and all of the above could still be said. Sometimes it’s hard to avoid connection with any of the above transgressions. Sometimes it’s not even a choice. When I ride the bus, do I know where the fuel comes from? BP? Exxon? Likewise, with the goods I purchase that have been hauled from one place to another. When I buy clothes for myself or my kids, can I always be certain of the conditions in which they were created? Can I avoid be “tainted” by goods and services through association, voluntary or otherwise? Well, maybe, but my guess is it would become a full time job, and I’ve already got one of those. The best I can do is the best I can to change the above in other aspects of my life. My hands will never be “clean.” Best I can do is wash them regularly. As for the rest, whether or not to drink the Kool-Aid depends on whether I like the flavor. I know that the products I’m buying come with some limitations, and by the time I reach the point of purchase, I’ve already decided whether I can live with the limitations, because they outweigh the features I do want. The bottom line for me when it comes to the Kindle Fire is simple: Does it do what I need it to do? And maybe a little bit more? Well, I ended up getting the Kindle Touch, sans 3G. I also opted for the “special offers,” which shaved about $30 off the price. I’ve only had it in my hot little hands for little more than a week, but I can say I’m definitely happy with my decision. The new features — like the ability to check out library books, and the Prime subscribers lending library — are excellent, and I’ve already tried them out. but the touch feature alone makes it worth upgrading and relegating my Kindle Keyboard to back-up status. I was curious to know how the touch feature worked, because it didn’t seem quite like a “true” touch screen. Looking at the rather deep bezel around the screen (compared to the Kindle Keyboard, in which the exterior was almost flush with the screen), I had my suspicions that it might be an infrared thing. A bit of Googling confirmed my suspicions. Capacitive touch is what’s used in most smartphones and tablets, including virtually all Android devices, the iPhone, iPad and newer BlackBerrys. It’s also the technology embedded in Amazon’s new $199 Kindle Fire, a multimedia tablet. Applying a capacitive-touch layer to e-ink, the black-and-white display that looks like paper, darkens the screen, said Sriram Peruvemba, an executive for E Ink, the company that makes the popular screens in e-readers, in an interview on Wednesday. For that reason, the Kindle Touch relies on infrared sensors, which are stationed along the edges around the screen to detect when the user’s finger touches a particular spot on the device’s face, an Amazon spokeswoman said. Tapping on most parts of the screen turns pages, rather than clicking a button like on the other Kindles. Amazon says the sensors allow for multitouch usage, meaning people can move multiple fingers at once to manipulate the screen, much like other touchscreen gadgets. After a week of tapping around on the Kindle Touch screen, I think the touch feature works pretty well. There have been moments when it seemed to lag a bit, but they were all either when I was shopping in the Kindle Store or using the experimental browser, so that could have been due to the wifi connection I was using at the time. As far as reading is concerned, it works great. Interestingly enough, because it’s not a capacitive touch screen, anything that breaks the infrared laser works You don’t have to touch the screen with your fingers for the touch feature to work. I’ve used pens and pencil erasers at times. I haven’t tried it, but I’ve read that the infrared touch feature also means that you can use the Kindle Touch while wearing gloves. I’m sure I’ll get around to testing this in the winter. Amazon has divided the screen into three regions. Tapping on most of the screen turns the page forward. Tapping on the far left of the screen turns the page back. Swiping works too — right to left turn to the next page, left to right to turn to the previous page, down to move to the next chapter, up to move to the previous chapter. I use a combination of tapping and swiping. Tapping at the top of the screen brings up a bar from which you can search, access the menu, or go to the Kindle Store in one or two taps. And this can easily be done with one hand. (Important for my morning and evening commutes.) So, the menu button is gone, replaced by the touch feature, along with the keyboard and the rest of the buttons. The loss of these buttons makes for a smaller device and a much more sleek design. I’ve read reviews by some people who are underwhelmed with the look of the Kindle Touch. And, truth is, there’s not much to see. The only button is the home button on the front, which had been morphed in to bunch of bars that look vaguely like a stack of books. The front is a metallic grey plastic with just a little bit of a “stainless steel” look to it. 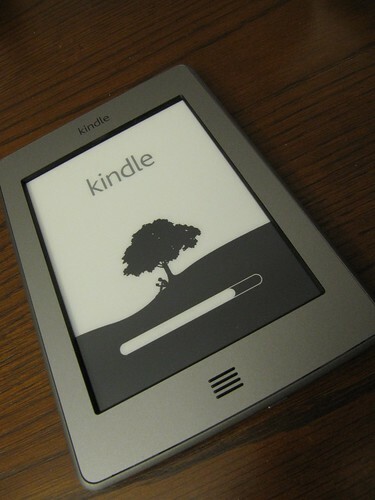 But according to Amazon, the design was geared towards making the Kindle Touch “disappear” in your hands. So, the hoopla over the device itself notwithstanding, the point is for the Kindle to get out of your way once you start reading. It’s kind of funny, but that’s really it. For all the new features in the Kindle Touch, and all the improvements, the point is ultimately for you not to notice the device very much. And you don’t. Amazon accomplished its goal here, using the new touch feature as an opportunity to get even more of the reader of out of your way. I liked the feel of the Kindle Touch immediately. It was smaller, lighter and easier to handle than the Kindle 3. And thanks to the loss of the buttons and the keyboard, it really does disappear in my hands once I got started reading. (After I finished playing with the touch feature, and trying out some of the other new features.) Once I started reading, I barely noticed the device itself anymore. Not only is the keyboard from the previous model gone, but so are the page turning buttons. While I’ve seen some reviewers cheer the loss of the keyboard, while lamenting the loss of the page-turn buttons, I don’t miss either. The keyboard on the Kindle Touch is no harder to use than the keyboard on my iPhone. It would be nice if it was as smart as the iPhone about word completion, etc., but I expect that future software updates might include that feature. The result, at least for me, has been a reading experience in which I hardly think about the device I’m using. It took about a minute to learn the ins and outs of page turning and/or swiping, after which it was easy to use the Kindle Touch with one hand. (If I’m holding it in my right hand, I swipe the screen from right to left to turn back a page or two, and tap the far left of the screen if it’s in my left hand.) The only criticism I have is that it’s not always easy to tap the top of the screen to get to the menu without using both hands (holding it in one hand and tapping the top of the screen with the other). Some reviewers, for this reason, would have preferred to see the “Menu” button included here. But I’d be happy if, say, double-tapping the “Home” button brought up the menu. The light is much better designed, too. Whereas the lighted case for the previous model pulled out of a corner of the cover, at an awkward angle that didn’t light the device very evenly, the light on the new cover swings out from the top. Though it causes a bright spot at the top of the screen, I think it lights the rest of the screen more evenly. Plus, closing the cover automatically shuts the light off. Some people aren’t happy that, unlike the lighted cover for the previous model, there’s nothing — no elastic strap, no magnets, etc. — to secure the cover when its closed, but I don’t have any complaints. If I’m carrying it in my hand or under my arm, it seems to stay closed. Even when I’m not holding it, the cover doesn’t pop open. This cover feels more secure in some ways, anyhow. First, the Kindle Touch fits very snugly into a firm inset that has a rubber-feel to it, and provides shock protection if it’s dropped. In fact, the Kindle fits so snugly that it takes some effort to pop it back out. The previous model was secured to the cover with two hooks that connect the light to the Kindle, but didn’t do much to secure the device. The couple of times I dropped mine, the Kindle popped right out of the cover. And, eventually, the plastic around the slot for one of the connectors broke, making it even less secure. This cover managed to connect the light with two small connections that make contact with the back of the Kindle once its in the case. Better all around. Bottom line: I’m happy with the Kindle Touch. Like a lot of people, I haven’t been happy Amazon increasing the price of some ebooks, but cost was not the only reason I made the switch to ebooks. For me, it was always more about convenience. Besides, I’m having fun exploring the Prime Subcribers’ Lending Library, and I keep an eye on the Kindle books for $3.99 or less and the Kindle Daily Deal. I understand the frustration of not being able to read DRM books on the Kindle, and have wrestled with it myself. But the number of books available for the Kindle seems to keep growing.